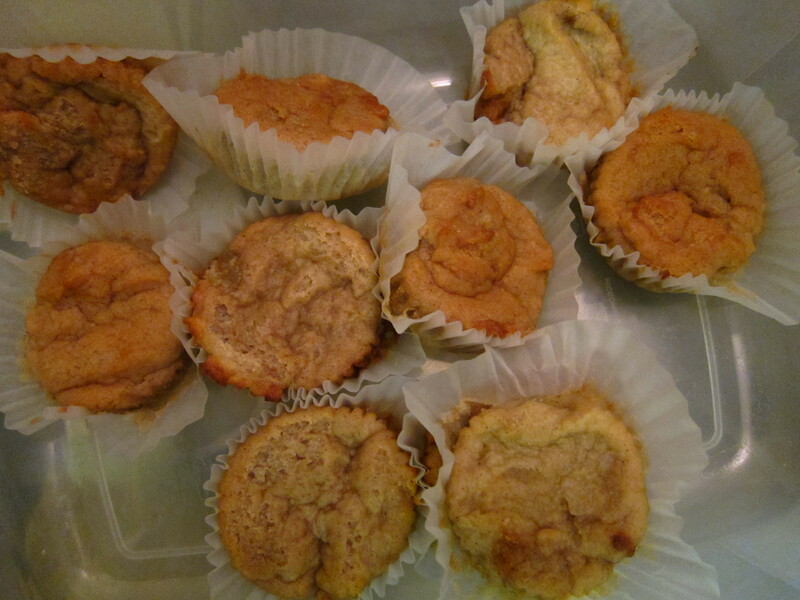 So the last thing [other than the Whiskey Banana Bread which I forgot to document L] in the care package is the sweet potato muffins. 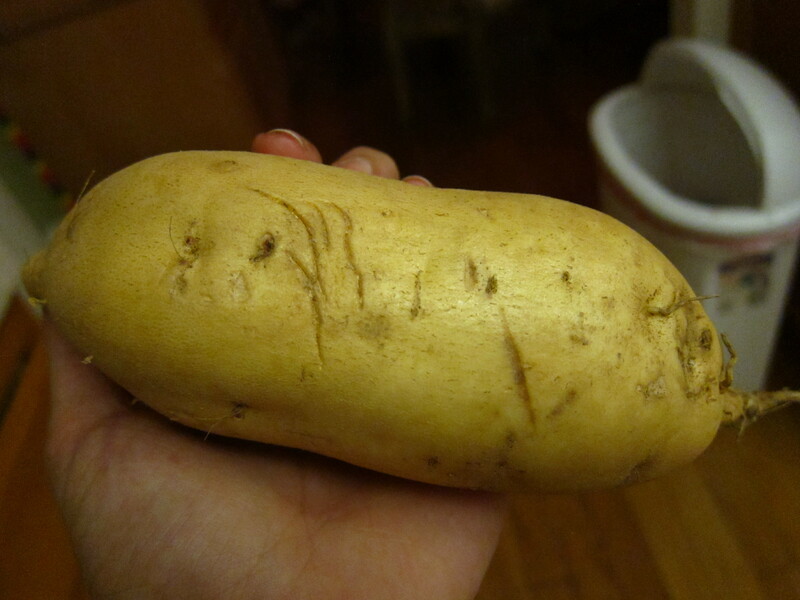 Here is a sweet potato. You need to peel 2-3 sweet potatoes and then boil them for half an hour or until soft. Then mash them! Make sure to mash them by hand and not by food processor because the latter will stir up the starch in the potato and ruin the texture of the cupcakes. 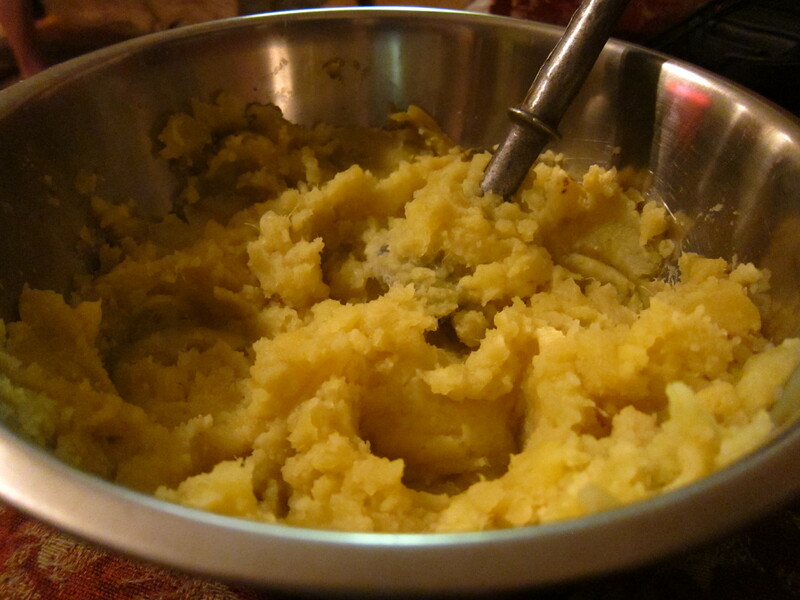 Then you have yummy mashed sweet potatoes. Then you make your batter, first wet ingredients, including your mashed sweet potatoes and then you add dry ingredients. Then divide batter evenly among muffin tin [I’d say fill them pretty close to the top because they don’t rise a lot] and bake for 18-20 minutes or till a toothpick comes out clean. Let them cool for 10 minutes and take out of tins. 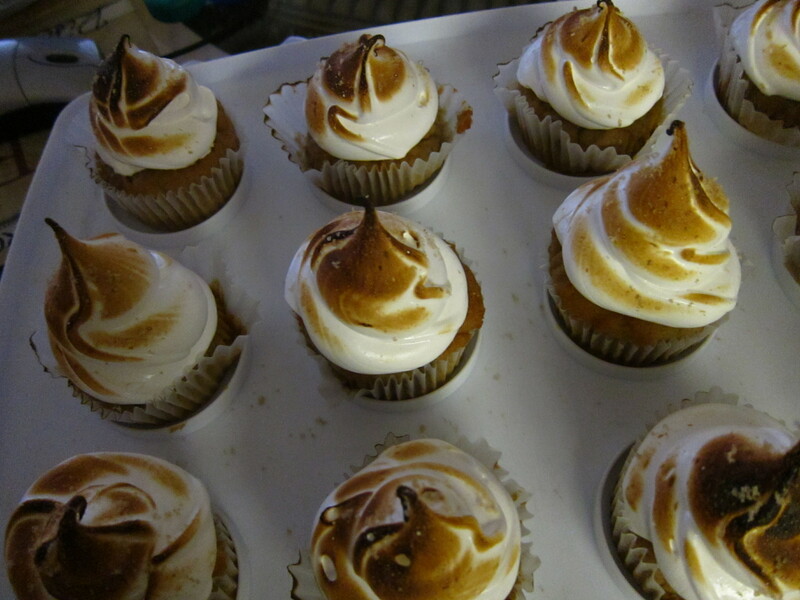 My frosting is a burnt marshmallow frosting to top the sweet potato cupcakes. 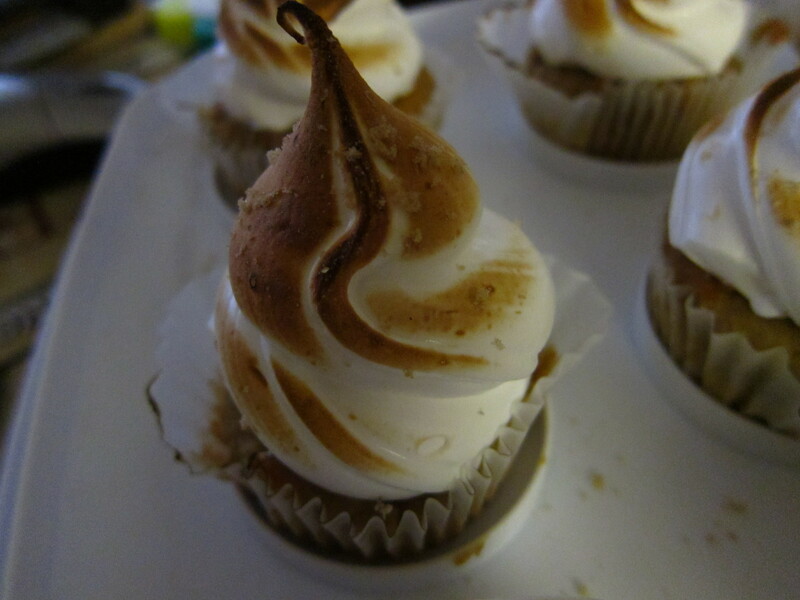 The Marshmallow frosting was real easy to make and I got another chance to use my torch! So you combine egg whites, sugar and cream of tartar in a double broiler or in a mixing bowl over a saucepan of boiling water. Whisk the mixture until the sugar is completely dissolved and take it to your electric mixture and whisk until peaks form and the mixture has cooled down [8-10 minutes]. While it’s whisking add the vanilla. 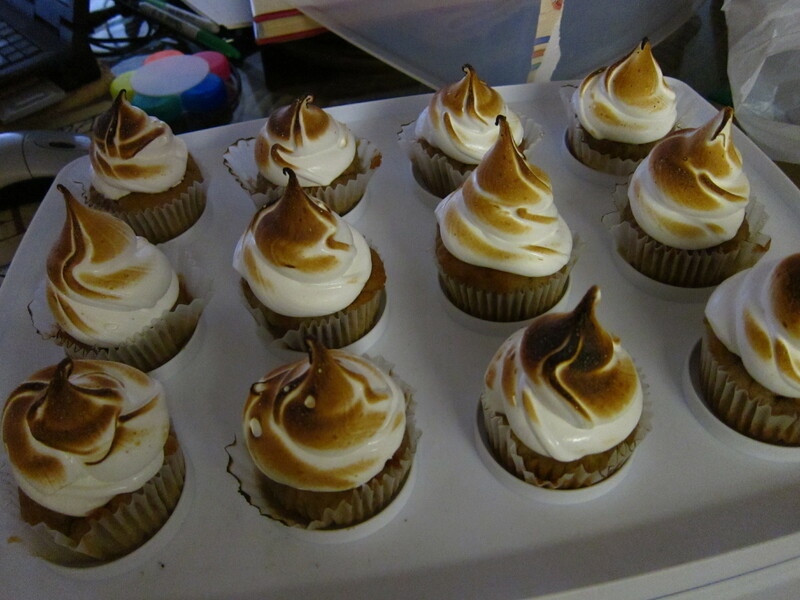 I sprinkled some brown sugar as a garnish for some of them and they looked pretty neat. They were quite delectable. It’s too bad I couldn’t; send them to Rob this way. Anyway, that was my care package. I promise to make the whiskey banana bread again so I can share it with you guys, it was very delicious and moist. Have fun baking! To make the frosting, combine the egg whites, sugar and cream of tartar in the top of a double boiler. (Note: I just set my clean, dry mixer bowl over simmering water, to avoid dirtying two bowls.) Heat the mixture, whisking frequently, until it reaches 160° F with an instant-read thermometer. Transfer the mixture to the bowl of an electric mixer fitted with the whisk attachment. 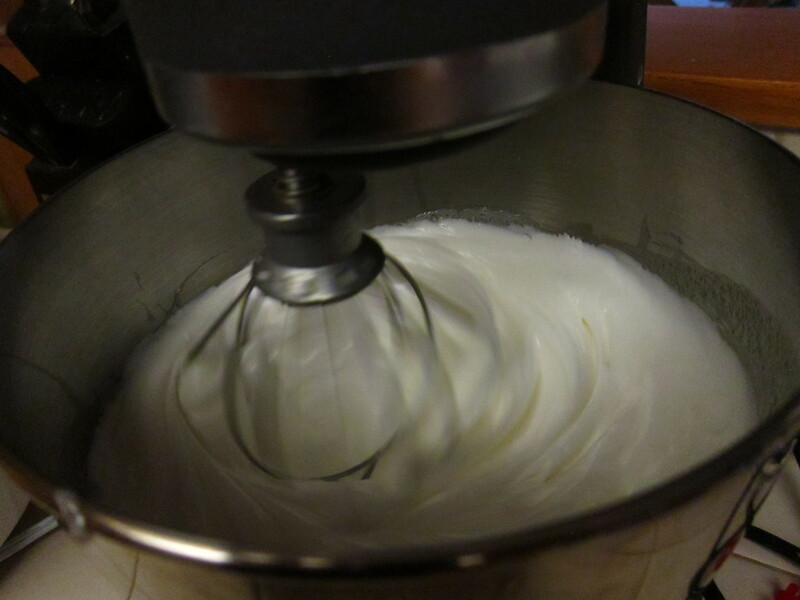 Whisk starting at low speed and gradually increasing to medium-high speed until stiff, glossy peaks form. Mix in the vanilla until combined. 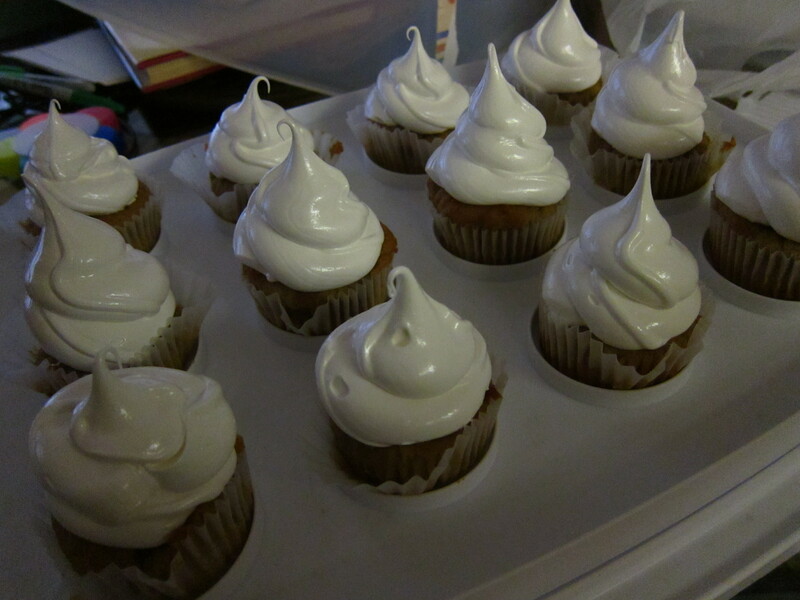 Frost cooled cupcakes as desired. Brown with a kitchen torch and garnish with a sprinkle of brown sugar, if desired.